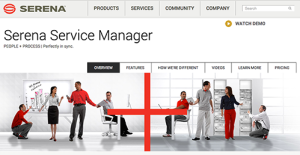 What is Serena Service Manager? Serena Service Manager is a system developed with a process-driven approach to ITSM. It allows business and IT to work together. This platform is easy to use, inexpensive to maintain, and provides wide visibility across the service delivery lifecycle. Serena Service Manager is the winner of Pink Elephant’s ITIL Innovation of the Year award. This product makes fluid and flexible IT service management possible. You can avail it on premise, in the cloud, or as a hybrid of the two options. Since each company has specific business wants, it is sensible for them to refrain from seeking a one-size-fits-all faultless software application. Needless to say, it would be useless to try to find such a system even among widely used software platforms. The smart thing to do would be to catalog the various essential elements that require consideration such as key features, budget, skill levels of employees, company size etc. Then, you should do your homework thoroughly. Read some Serena Service Manager reviews and investigate each of the other apps in your shortlist in detail. Such in-depth groundwork can make certain you reject ill-fitting platforms and choose the app that presents all the aspects you require for business success. How Much Does Serena Service Manager Cost? Serena Service Manager offers flexible deployment and pricing options. The solution is available for deployment on premises, via the Cloud, or through a hybrid model that leverages your existing ITSM investments. Serena Service Manager on demand’s pricing starts at $89/user/month. For more pricing information, contact the vendor. We realize that when you make a decision to buy Customer Support Software it’s important not only to see how experts evaluate it in their reviews, but also to find out if the real people and companies that buy it are actually satisfied with the product. That’s why we’ve created our behavior-based Customer Satisfaction Algorithm™ that gathers customer reviews, comments and Serena Service Manager reviews across a wide range of social media sites. The data is then presented in an easy to digest form showing how many people had positive and negative experience with Serena Service Manager. With that information at hand you should be equipped to make an informed buying decision that you won’t regret. What are Serena Service Manager pricing details? What integrations are available for Serena Service Manager? If you need more information about Serena Service Manager or you simply have a question let us know what you need and we’ll forward your request directly to the vendor.